Many Traveller Referees have crafted a robot system for MegaTraveller based on Traveller Book 8: Robots. 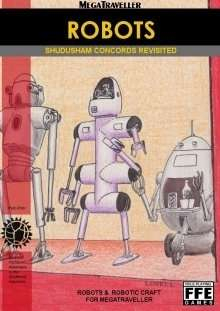 The Errata for MegaTraveller by Don McKinney indicates that incorporating robots into MegaTraveller is a known problem, and no obvious solution exists. The editor of this supplement took it upon himself to bridge this gap. He started a discussion thread on the Citizens of the Imperium discussion board, and others contributed a lot of valuable material. The biggest contribution came when Ewan Quibell found a draft of a proposed MegaTraveller Robots supplement by Rob Prior, who started to cover many issues beyond construction and design in his work. That text served as the foundation for this completion and elaboration. This title was added to our catalog on September 11, 2011.